Provide comfort for the family of Matthew Knoke with a meaningful gesture of sympathy. 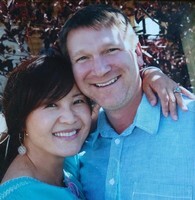 Matthew Allison Knoke, age 52, died after a two and a half year battle with cancer on March 23, 2019 in American Fork, Utah. Matt was born in St. George, Utah on February 6, 1967 to Michael Knoke and Mary Ann Seegmiller Batt. Matt was an adventurer, so he called many places home. He was raised in St. George, Utah; he moved to Washington state where he graduated from The Evergreen State College. His travels led him to Todos Santos, Mexico. He fell in love with the town just before meeting and falling in love with Jung Suk Lim. They were married on November 7, 1998 and together built a Thai restaurant in Todos Santos. After spending some time in South Korea, Matt and Suki returned to school in Washington State where he became a nuclear technician. Matt was filled with love and kindness. Matt was preceded in death by his furry child, Happy; and his uncles, Douglas Knoke and Frank (Paz) Knoke. He is survived by his wife, Jung Suk Lim; his parents, Michael (Leah) Knoke and Mary Ann (Gordon) Batt; two sisters, Treesa (Clinton) Collard and Nefretyree (Christian) Jensen; three brothers, Destry (Kristy) Batt, Cody (Sariah) Batt, and Cale (Ruth) Batt; 14 nieces and nephews; and two great nephews. Funeral services will be held on Wednesday, March 27, 2019 at 11:30 am at the Homestead Chapel in Enoch, Utah. A memorial bonfire will be held at Three Peaks at 5:00 on the same evening. To send flowers in memory of Matthew Allison Knoke, please visit our Heartfelt Sympathies Store.